It’s Mom’s Birthday and I’ve Got a Peach of an Idea! As you may, or may not, recall, August is the birthday month for a number of people in my life, with today, August 15th, being Mom’s birthday as well as that of her Mother, Grandma Bartolini. Zia’s husband, “Uncle”, was born on the 11th — and we’re just getting started. My Friend, one of the Kitchens’ tasters, had a birthday on the 7th, while another, my Friend the Entertainer, will be celebrating on the 20th. And we mustn’t forget the kids. My Grand-Nephew’s birthday was the 1st, my not-quite-a-nephew Nephew will be blowing out candles on the 24th, and the Oldest of the Boys Upstairs has a birthday this Saturday, on the 18th. That’s a lot of birthdays! So to celebrate, last August I posted 3 separate ice cream recipes that I combined for the finale. The first was taken from a recipe book that Mom gave me shortly after I moved to Chicago in 1980. 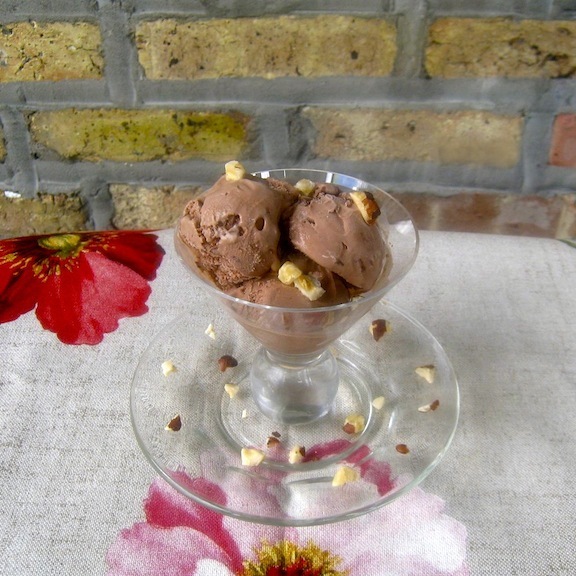 Next on that month’s agenda was an ice cream based on Mom’s own chocolate recipe. Then came the third recipe. Again, using Mom’s recipe as a base, I created this “pretty in pink” ice cream. Well, with those 3 recipes laying the ground work, I had little choice but to put them together. As great as that all sounds, this year I was in quite a pickle. What should I do for this year’s Birthday Month? 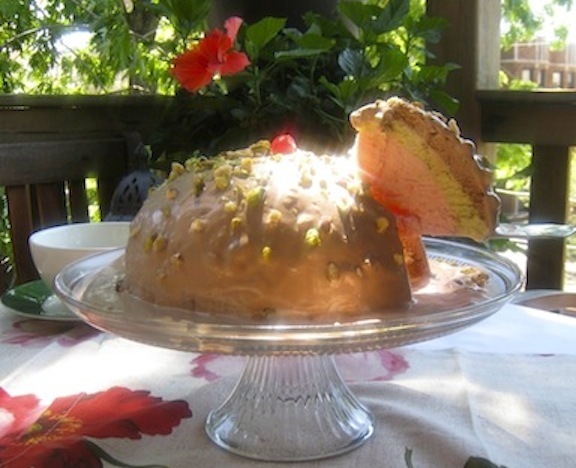 How could I possibly top a Spumoni Bombe? Well, I can’t and won’t even try. What I will do, however, is share a recipe for an ice cream flavor that Mom loved. Yes, when it came to ice cream, Mom had a number of favorites. Frankly, I doubt that Mom ever tasted an ice cream that she didn’t like — and we haven’t even mentioned sherbet yet. So, with that monkey off my back, I decided to take full advantage of the bounty in this area’s farmers markets. Today’s recipe will be for peach ice cream. It’s a simple recipe that results in a peachy frozen delight. It’s Mom’s birthday, however, and “peachy” just won’t do. Directly following the recipe is a serving suggestion that Mom would have surely enjoyed. I hope you will, too. Now, if you’ve no experience working with peaches, this paragraph is for you. In the first place, you may not be able to find fruit that are perfectly ripe, even in your farmers market. Just place the best you can find in a paper bag, place it on a counter, and check them every morning. In a couple of days, your peaches will be exactly how you like them. So, once your peaches are ripe, how do you peel them? Bring a large pot of water to boil. In the meantime, fill a large bowl with iced water. Take each peach and use a paring knife to cut a small “X” into the fruit’s bottom. Place the peaches into the rapidly boiling water and leave them there for about 30 seconds. Transfer them to the iced water bath to cool and to stop them from cooking. After a few minutes, simply peel off the skin beginning at the “X”. You may need a paring knife to trim a stubborn spot or two but, basically, that’s all there is to it. And that’s the last of any possible problems you might run into. Once the peaches are peeled, cut each into chunks, removing the pit in the process. Place the peaches and water into a non-reactive sauce pan and cook over a medium heat until the peaches are soft — about 10 minutes. Remove from heat, add the sugar, stir well, and set aside to cool. When the peach mixture has reached room temperature, place it in a food processor or blender, along with the sour cream. whipping cream, vanilla extract, cinnamon, and salt. Purée until blended but still a little chunky. Place the peaches & cream mixture into the fridge until thoroughly chilled — about 4 hours, more or less depending upon your fridge. Add the chilled peaches & cream to your ice cream machine and follow the manufacturer’s instructions to create your peach ice cream. Peaches are in season and we shouldn’t let this opportunity slip away. About 45 minutes before you serve your peach ice cream, peel and slice a ripe peach, more depending upon how many servings are to be prepared. Place the slices in a bowl, sprinkle with sugar, stir gently, and set aside. When ready to serve, divide the peach slices and juice among the servings of ice cream. Garnish with toasted chopped pecans. This entry was posted in Family Recipes, Sweets (Dolci), Vegetarian and tagged Food, Fruit, Ice Cream, Italian, Peaches, Recipes by ChgoJohn. Bookmark the permalink. My mom always stirred a little berry sugar over her fruit just as you did. I had some peaches and now I’m down to 3.. and I can’t bear to eat them because then there won’t be any left. Isn’t that silly? But the Peach Lady’s Daughter at the market here is between crops of peaches and we are gone before she has more. I will definitely try putting some peaches in a bag when I get back to Calgary so that they will ripen up faster. That is also where my ice cream maker is.. oddly enough, it belongs here at the lake where it’s so hot I crave ice cream! That Bombe.. wow!! Spumoni is the best! What a busy birthday month.. and a lucky mom!! You’re at the lake? When I was a boy, this was our family vacation time and we often rented a cabin somewhere along Michigan’s shoreline for a week or two, depending upon Dad’s schedule. Those were special times, all right. Now, how could you leave your ice cream maker at home? Each time I visit Zia in the Summer, I bring my machine because like her sister, my Mom, Zia loves ice cream. I make sure I leave her with a few quarts in her freezer. I do wish Mom were here to see how well-received the family’s recipes are. She and Zia never considered themselves to be exceptional cooks, no matter how much I told them otherwise. Mom would be surprised, and then thrilled, to see this blog’s reception. And I’d be pleased to see her get some much-deserved recognition. What a lovely sentiment to your Mom, John. Thank you so much, Eva. What a wonderful way to celebrate all these birthdays – enjoy them all! I love the idea of peach ice cream….i don’t usually make ice cream, preferring easier granitas or sorbets – but I think i’ll be tempted to try this one! Thank you! Mom so loved ice cream that I could not ever come up with a better recipe to commemorate her birthdate. It was only many years later, as an adult, that I realized all of those times she took us for an ice cream was more for her benefit. When you think of it, for a child, is there anything better than having a Mom that loves ice cream that much? Thanks, Roger. Jenny shares her birthday with some very special women in my life, as you can well imagine. I hope she has a great day and year. Please give her my regards. Thank you, Yvette. You know, Bella’Roma is the only rose I chose by name alone. In fact, it’s picture was nothing at all to look at but I loved the name. I’ve friends that whenever any of us are in Rome, the first post card we send to each other says nothing but “Che bella Roma!” How could I not buy this rose? As it turned out, its colors are so much more muted and, to my eye, more beautiful than advertised. Che Bella Roma! cannot think of a better way to celebrate such a festive month! Happy Birthday to everybody John. We shall toast in your mom’s honour this evening. What a perfect refreshment for the dog days of summer! I find it interesting that the same technique for tomatoes extends to peeling peaches. Hi, David. I was surprised to learn the peeling trick a few years ago when I began making peach cobblers. It is exactly the same procedure used for tomatoes and equally easy. For me, though, it’s a little harder to resist sampling the peeled peaches, especially once they’re sliced. I find them irresistible. Thank you for sharing this wonderful recipe. 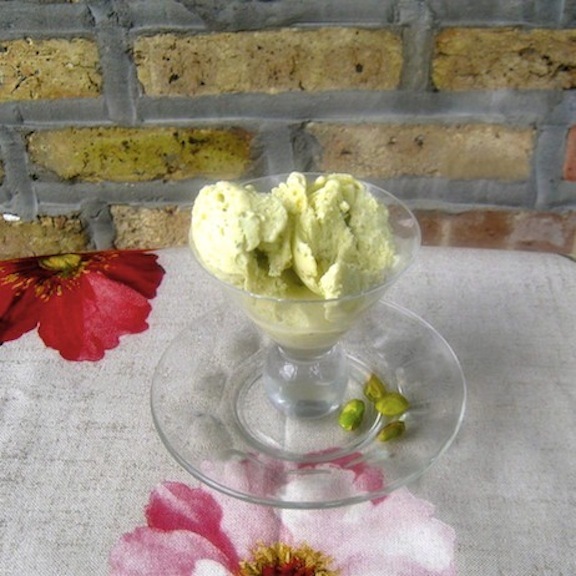 This brings back memories of my Grandmother’s home made ice cream that all the grandchildren loved. A wonderful way to celebrate a birthday. HAPPY BIRTHDAY to all your family members and friends. Thank you also for the tip about peeling peaches. Happy Birthday to the Bartolini family and fortunate extended family. What a great dessert to commemorate such a festive month. I’ve never had peach ice cream but I suspect I would love it. The spumoni bomb looks amazing; as do the parts thereof. Is that brick I see in the pistachio nut ice cream? How wonderful to have such a cool backdrop. That is the curse of being a food blogger, isn’t it John. But I do feel fortunate to have met so many lovely people. Yes it is, Eva, but you,also, mentioned one of its blessings: the people we’ve met. All in all, they’re good people and knowing them far outweighs a couple almost wam meals. Happy birthday to everyone!!! That bombe is amazing!!!! It really is. I love the peach ice cream though. That would hard to resist. Fresh peach ice cream is truly a summer time treat. Good choice!!! I’m guessing everyone with a birthday this month will be asking you to make their favorite ice cream flavor as well! I know I would! Something with coconut perhaps?? Thank you, Tanya. You know, no one has ever requested coconut. To be honest, they are all pretty much hooked on the blueberry cheesecake ice cream. In fact, I just finished making the last of 4 quarts that I’ll be delivering. Coconut, huh? I need to check into that. It does sound good. You may get lucky with the peach ice cream, Teri, but there will never be any excess of the blueberry. That ice cream is in high demand. It really is that good. Happy August birthday to the clan!!!!! Celebrating with ice cream, way to go!!!!! I try very hard not to have ice cream in the freezer as I would eat a pint at one sitting. Your peach ice cream sounds so delightfully delicious, just what is needed during this hot and humid weather. Glad to see your roses are coming back. Bella’Roma is gorgeous. Thank you, Norma. Although I make a lot of ice cream, I give most of it away. Like you, if I have it in the house, I’ll eat it. The roses are doing better but I’m really working now for next year. I have my doubts about a couple of them and only time will tell. Your bombe could easily grace the pages of a food magazine-wow! How I wish I filled one of the chairs at that spread. plus detailed instructions from start to finish so the rest of us can replicate these summer ice creams and peel a peach with proper technique. Your mother would be so proud of her amazing son as you bring her lifetime of food preparation to life and share your heritage and every delicious recipe with the world. Thank you, Ruth, for leaving such a nice compliment. Mom would be surprised and thrilled to se how wonderfully you all have responded to her recipes. She never gave herself credit for being a good cook. The colors of Bella’Roma are so muted and I love the mix of pink and yellow. The pink “arrives” as the bloom opens wider. It’s a beautiful transformation. Spumoni is my favorite! And I was just looking at a box of peaches in my garage trying to figure out what to do with them. This post came just in time! All of your ice cream photos look absolutely delicious…I don’t think I could pick just one! Hello, April, and thank you. Spumoni is a favorite of mine, too. We always had a box of individually wrapped slices in our freezer when I was young. Getting 3 ice cream flavors at once? I was in heaven. I love the way you added the fresh peach as a base for the peach ice cream–I cannot get enough peaches this time of year! You are right, you cannot let the opportunity slip away when peaches are in season. I’m with you, Judy. In fact, once the peaches were peeled, I had to stop myself because I kept snacking on them. It was either stop or start peeling more. There’s nothing like a ripe peach! Happy birthday to your mom and all the other August birthdays! What a tribute to your mom. Just perfect! I actually remember these posts from last year. I think that’s right around when I started following (and am I happy I did). And I had no idea you could peel the peaches the same way as tomatoes. Cool! Hello, Kristy, and thanks. You did start following me about a year ago. Over the weekend, I made a batch of giardiniera and I re-read that post, You introduced yourself in the comments — and I’m so glad that you did! Didn’t that year just fly by? Amazing! !hat a wonderful way to celebrate a special woman John! As I read this post I kept thinking of cheesy lines abot how peachy life is, but as you see I’m holding myslef back and not doing that. And bella Roma is indeed Bella ! Hello, Claire. I think we should all be commended for staying on this side of the “cheesy line”. It was so tempting but none of us crossed it — yet. Those are all amazing – how do I choose? Sorry, MD. I am very accepting of culinary customs and believe I’ve an adventurous palate. But Baby Gaga? Oh my gorgonzola! That ain’t right! Still, thanks for the heads-up. I guess I’ll file this under the heading of “items for a lull in the conversation’, although mentioning this would probably completely stop all conversation. It looks like you’re right, MD, but it looks like people did purchase it — which amazes me, no end. You truly are the ice cream King, John! They are all so beautiful and I love your peach ice cream…it sounds amazing with the sour cream and the cinnamon. Wish I still had peaches to try it with, but next year for sure. My mom’s birthday is also this month and we are getting ready to party with her. Happy birthday to all of the special people in your family and your friends! 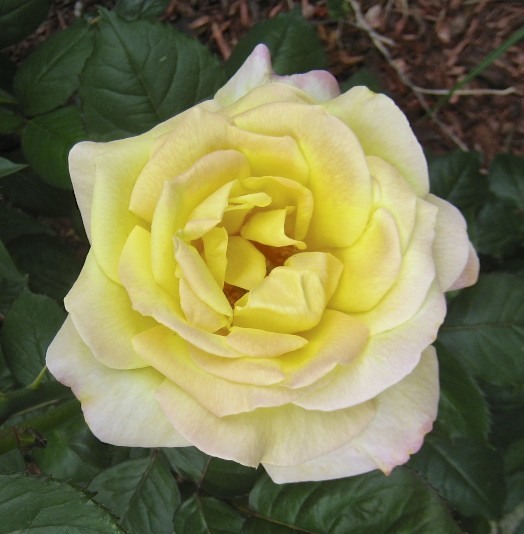 And another fantastic rose with the tinged petals…so pretty. Thanks, Betsy. If ever one needs proof of the differences in our climates, look no further than peaches. Yours are long gone and, at our farmers markets, peaches are at their peak. You would never believe the “official” photo of this rose. The colors are much more vibrant and, to me, rather garish. Environment plays such a role in rose color and, luckily, my yard favored the muted colors you see. Not bad, eh? Indeed, not bad at all I should say! Enjoy your peach time. There are a few local ones left, but they are small and hard and methinks they got frozen at some point…not the glut of fabulous ones I enjoyed May-July. But at least I had time to eat a lot of the good ones! I am enjoying it, Betsy. I’ve got another 10 lbs, or so, right now and I’m trying to decide what to do with them. I know I’ll be buying more this weekend. I just can’t help myself! 🙂 I totally get that! Hi John, what a great post for everyone’s birthday, and especially to your Mom. All of the ice creams are beautiful and sure delicious! Your Mom would be so proud of you! Such a nice thing to say, Marina. Thank you very much. I was so new to blogging when you first posted these scrumptious recipes I wasn’t following anyone yet! LOL! I have some catching up to do on these very special recipes! I love ice cream and think I’m going to have trouble deciding which recipe to try first. The peach is so summery, but you had chocolate in there, and that’s a weakness for me…or is it a strength, perhaps! And then there’s Spumoni! Wow! How special to have so many reasons to celebrate family! I know how much you miss your mom and others, John, and it is such a lovely tribute to the closeness of your family that her birthday is still celebrated today. I really love that. A very happy birthday to all, and aren’t you wonderful to make special ice cream. I’d like to pick up that traditio for my family! That chocolate recipe is a good one and I received a number of compliments from those who’ve had the spumoni. Still, as I mentioned in the post, the favorite of everyone is the blueberry cheesecake ice cream. The pudding mix gives it a great texture & mouth “feel”, while the crumbled graham cracker crust makes you instantly think of cheesecake. It’s been called “crack” ice cream and with good reason. Sill, know your audience. 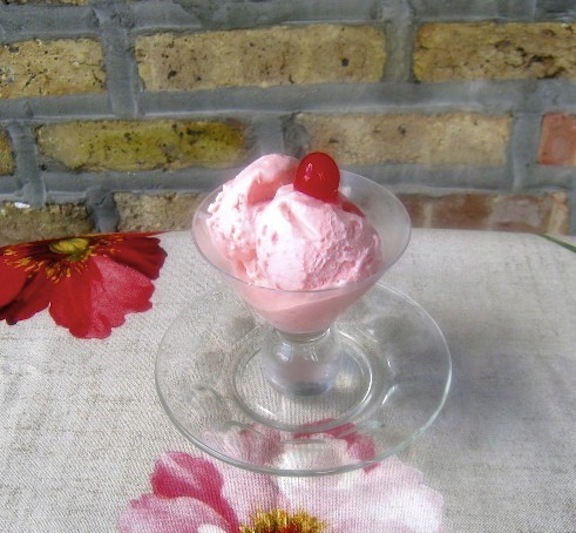 The maraschino ice cream is about as pink as you could want. It’s a big hit with the Barbie set and, I’d imagine, your Granddaughters. Peach? Peach? 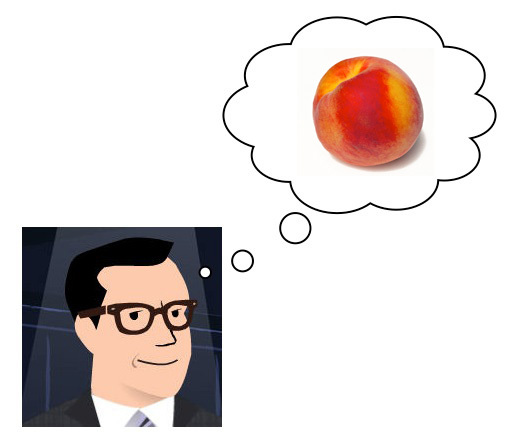 Did you say peach? Now that is the one thing I’ve got plenty of. I’m experimenting with a bundt today, so no go on the ice cream this week. But next week it is ON!! The key to this ice cream, Jed, is the fresh peaches and chopped pecan garnish. They really do make this dessert. I’ve another recipe to try and I hope to make it this weekend. It uses peach nectar as well as peaches. I’ve all the ingredients and will let you know how it turns out. Oh, this ice cream sounds so good with the sour cream in it! I like the serving suggestion, too. Happy Birthday to your Mama — may she have many happy returns. Thank you, Sharyn. If you do make this ice cream, be sure to follow that suggestion. It really makes this a great dish of ice cream. Oh, dear! I hope you’re not too uncomfortable and that they gave you some pain pills so that option is available to you, if need be. Now, get some rest! That Spumoni Bombe is darned impressive. It’ll be awhile before you top that. But the peach ice cream is pretty good too. You don’t see peach ice cream that much these days (it’s out there, but you have to search for it), but its flavor is great. Nice job – thanks. Thanks. The only place I’ve seen peach ice cream nowadays is at an ice cream parlor — and they’re few and far between. Peaches, though, have just peaked at our farmers markets and it’s the perfect time to be making ice cream. Next up: preserves! You have me beat in the August birthdays department and I thought I had a ton! My brother and brother in law have the same birthday (13th) and my mother in law’s birthday is the 12th! 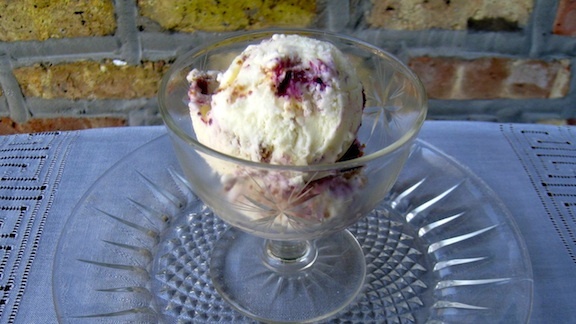 All of these ice cream recipes look delicious…especially the blueberry cheesecake! Happy Birthday to your mom!!! I’ll take a scoop of each of those ice creams, and a bowl – big bowl- of the peach please! Bobby just told me it was time for another batch of ice cream and I know what I’m going to make – my favorite – peach!!! I love your recipe because it doesn’t use eggs and I can make a small batch in my little ice cream maker. Fantastic! We mustn’t forget the Blond Ambitious One, celebrating number 54 today. Where’s the “sugar cones” ? Peach ice cream is my absolute favorite! It’s high time I get an ice cream maker! Yes, it is! Mine is a Cuisinart and I was lucky enough to come upon a sale an Amazon. For the regular price, I rec’d an additional freezer canister. What a great bonus to receive! I’ve a box freezer in my basement where both live in permanent residence. GIve me some cream and I’ll be making ice cream in no time! Just love the sound of all those ice-creams and what a super way of celebrating all those birthdays of loved ones past and present. Of the 2 recipes, Celi, definitely go with the berry. Trust me. Yes, we had a good storm pass through in early morning and showers following until about 10:00 am. We may get more on Sunday and I hope they stretch fan enough south to hit the farmy. At this point, you need it far worse than we do. It was one of the smartest purchases I’ve made. Not only do I enjoy the ice cream but it really does make a great surprise gift. I love dropping off a quart of a friend’s favorite flavor. ANd my machine makes a little more than a quart, so, I give the quart away and keep the excess for myself. It works out perfectly. I love all your posts. Have some peaches for you. Makin ice cream for the dog days. I have bought an icecream machine earlier this moth and did not use it yet! I scream, we scream for ice cream! Beautiful way to celebrate! The peach ice cream looks fantastic! Buon compleanno alla mamma da parte mia! THank you so much, Ambrosiana. Mom so loved ice cream that I can think of no better way to remember her special day than to do it with ice cream. And I’ve no worries of whether she would like this flavor or that. She loved them all! A birthday theme month 🙂 I think November is the month we have the most birthdays, mine included. I’ll put my thinking cap on. Your family has a LOT of Leo’s. Who gets to be the boss? You’ve flabbergasted me! You sure knows your icecremas, John! (as my yaya would say.) Sour cream adds just the thing that the peach loves and needs, and cinnamon! Beautiful combination. And the others, they ARE da bomb! simply wow! Your Yaya and my Nonna went to the same English language course! I bet the tow of them would have hit it off famously! My Mom loved ice cream, Spree, there is no better way to commemorate her birthday than with an ice cream. She’d love this! 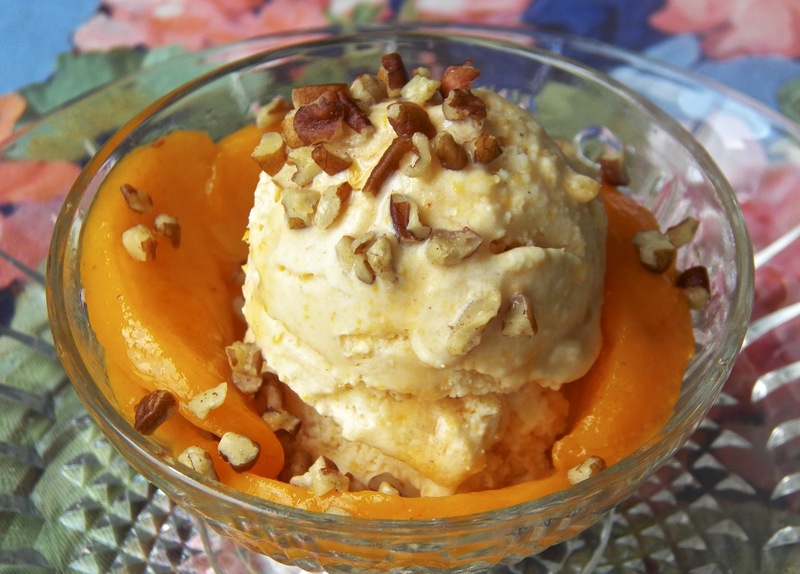 Peach ice cream with fresh peaches and pecans would definitely make your mother smile. Thank you, Karen, for leaving such a nice sentiment. Yes, this ice cream would have definitely pleased her. Thank heavens I’ve got some peaches here or you would be in big trouble for getting me so revved up for them just now!!! Kathryn, I’m embarrassed to say how many pounds of peaches I’ve bought this season. Next year, if I can figure out a way to keep them fresh, I’ll buy a bushel and quit all of these runs to the market for more. There are more recipes to come. Wow, I know this is such a busy Birthday month for you. I hope you had a great Thursday with beautiful memories of your mother. Good, can always be fun with birthday celebrations. Very good, I am sure she is proud.